SEOUL, Feb. 8 (Yonhap) -- North Korea showed off its latest long-range missile during a military parade in Pyongyang on Thursday, a day before the opening of the Winter Olympics in South Korea. A trailer carrying the Hwasong-15 intercontinental ballistic missile (ICBM), which the North claims is capable of reaching the mainland United States, rolled through Kim Il-sung Square in front of leader Kim Jong-un, who was saluting back to goose-stepping troops and sometimes beaming a smile, film footage released by Korean Central Television showed. Other weapons on display included Hwasong-12 and Hwasong-14 ballistic missiles, various types of artilleries, tanks and armored vehicles. A group of warplanes briefly flew over the venue in formation, creating the number 70 with aerobatic smoke to celebrate the 70th anniversary of the founding of its armed forces. Kim, wearing a black coat and felt hat, delivered a speech. He described the North's 1.1-million-strong military as a powerful "treasure sword" to defend the country. "We will have to prevent aggressors from attempting to infringe or ridicule our dignity and sovereignty even by 0.001 millimeter," he said. He added that the parade would demonstrate the North's status as a world-class military power. 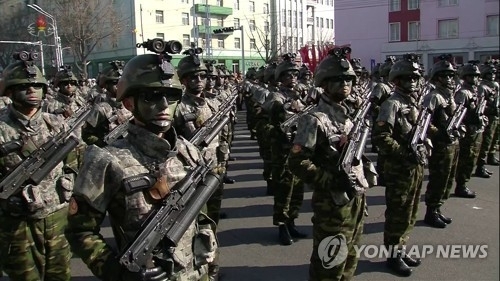 South Korea's military officials said the parade was apparently smaller than the previous one, which began at 10:05 a.m. on April 15 last year, finished at 12:56 p.m. and was broadcast live. It was to commemorate the 105th anniversary of the birth of the nation's founding leader Kim Il-sung. "South Korea and the United States learned that North Korea's military parade started at 11:30 a.m. (Seoul time)," an official at the Joint Chiefs of Staff told reporters. The U.S. has advanced satellites closely monitoring the North's military activity. It lasted only about one and a half hours and featured a "reduced program," according to the official, who asked not to be named. In a rare move, the North also skipped the live broadcast of the street event, which outside observers view as an attempt to keep it low-key. A Seoul official construed the North's scaled-back parade as an apparent sign that it took care not to hamper Seoul's efforts to use the Olympics as a chance to promote peace on the Korean Peninsula and beyond. "The fact that the North did not broadcast the event live ... this is a message (from Pyongyang)," the official said, declining to be named. "It seems that the North, on its part, thought of (how to) make the PyeongChang Olympics the Peace Olympics." 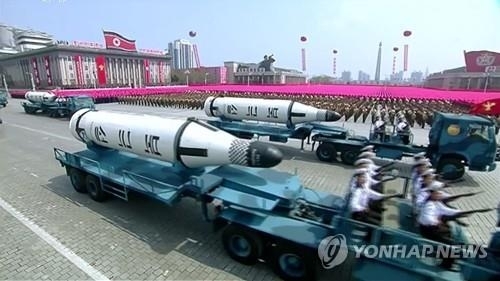 Some observers noted that though the North showed off its ICBM capable of striking the continental U.S., it did not showcase its new strategic weapons systems during the parade in an apparent move to not provoke Washington further. 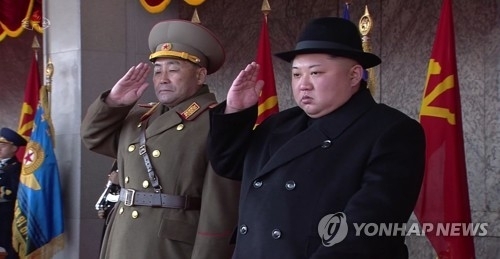 Meanwhile, Kim's wife Ri Sol-ju took to the reviewing stand along with him, as well as several other top officials including Kim Jong-gak, the newly appointed chief of the military's powerful General Political Bureau, and Kim Yong-nam, the nation's ceremonial head of state who will lead a delegation to the opening ceremony of the Olympics in PyeongChang. The North used to mark the military holiday on April 25, but it recently announced a date switch to Feb. 8. Dismissing criticism about such a military event on the eve of the start of the Olympics south of the demilitarized zone (DMZ), the North's state media said the scheduling had nothing to do with the global sports festival. The parade came amid renewed hopes for improved inter-Korean ties. The North has shifted to a peace offensive following a series of ballistic missile and nuclear tests in 2017. The North Korean leader's younger sister Kim Yo-jong is scheduled to visit South Korea as part of the delegation to PyeongChang. Known as one of the most powerful figures in the North after Kim Jong-un, she plans to meet with President Moon Jae-in on Saturday.